This is a totally new concept for the Club and, although it is a "Club Layout" it deserves a page of its own. With the new Club premises of the Signal Box and the Goods Shed, a substantial berm was built on the western side of the signal box in part to divert water into proper drainage to prevent flooding. 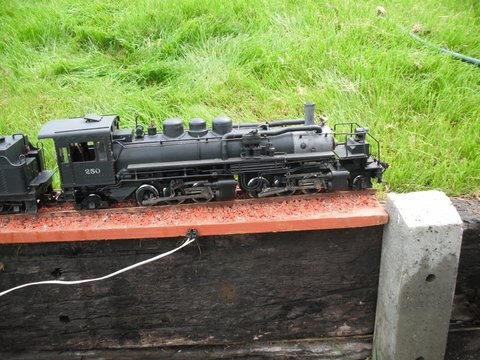 Before long, it occurred to one of our members that this was almost perfect for a G scale railway. This would truly capitalise on our new premises as we have nver before had room for an outdoor railway nor had we done anything in G Scale. 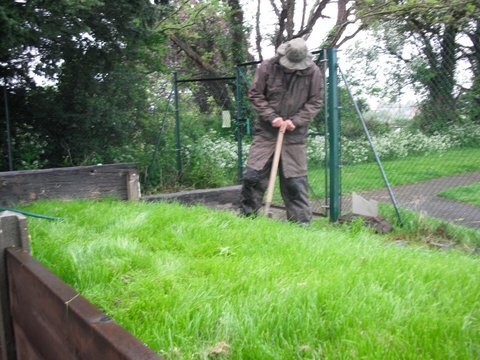 On May 10th 2014, the first sod was cut by the member who came up with the idea. As one might expect, being England, the weather celebrated by raining! Here we see the work force hard at it - again in typical British style. Sorry, actually a pause for careful consideration. 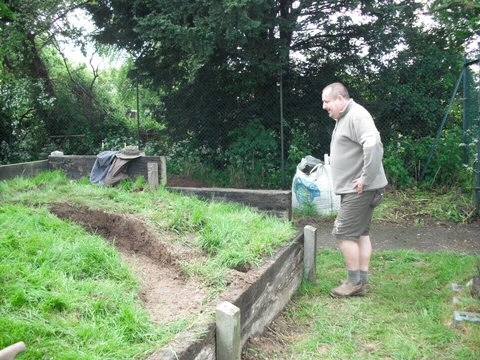 The work force was ably assisted by our Chairman and our Treasurer, suitably attired and, as you can see, they brought their buckets and spades! 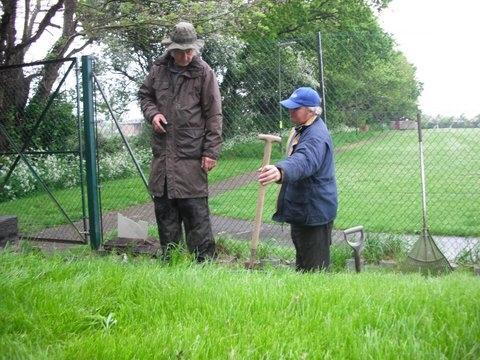 The rain did finally stop and here you can see our Chariman admiring one of the cuttings for the railway to run through. One of the locos destined to run on the layout - an USA 2-6-6-2 Mallet tender locomotive. As this page is being written I can confirm that track laying is completed and that the members have already been enjoying this immensely. Now that we are getting dark evenings, the added benefit of loco and coach lights is also being appreciated. Hopefully there will soon be more photos to follow.